This evening our family attended an evening presentation at Wilson Elementary in Oklahoma City Public Schools for families entitled, “Arts Integration at Wilson Elementary.” The interactive workshop was led by Randy Barron, a “Kennedy Center Teaching Artist” who has been working with Wilson teachers the past three days as their interpretive dance integration coach and mentor. Wilson is not a private, charter or magnet school, it is a neighborhood public school in the heart of Oklahoma City. Randy’s presentation tonight was interspersed with interactive lessons he facilitated in the “shared space” which was the back of the school auditorium. It was a very experiential, kinesthetic learning time! Randy’s work this week is part of the Kennedy Center’s “Changing Education Through the Arts” (CETA) program. Randy explained the differences tonight between Arts curriculum, Arts enhancement, and Arts integration. Arts curriculum involves formal classes in the visual arts, learning dance, vocal music, instrumental music, etc. Randy said only 7% of all schools nationally (in the U.S.) have a dedicated drama teacher, and the vast majority of those are secondary schools. Very rarely do you find an elementary school with a full time drama teacher. Wilson Elementary has one, and we met him tonight after the program! 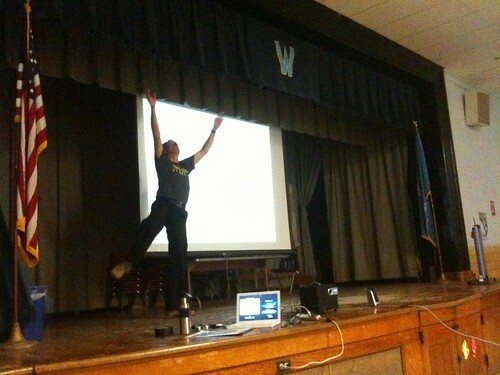 Wilson is the only elementary school in all of Oklahoma City Public Schools with a full time drama teacher. Arts enhancement is using something from the arts to help enhance learning, but largely in a superficial way. Randy said learning to sing “The Fifty Nifty United States” might be an example of arts enhancement in social studies. an APPROACH to TEACHING in which students construct and demonstrate UNDERSTANDING through an ART FORM. Students engage in a CREATIVE PROCESS which CONNECTS an art form and another subject area and meets EVOLVING OBJECTIVES in both. Randy pointed out the connection between the arts and a content area is always NATURAL as well as SIGNIFICANT in arts integration. Not so for “arts enhancement,” as I’ve seen and experienced previously many times. This evening was a wonderful experience for all the members of our family. How often do we have chances like this to actively learn together, and especially to dance together?! Not nearly often enough! The last time I remember dancing in public with my kids was at my cousin’s wedding in September 2008. We had a blast, and my six year old even showed everyone some breakdancing moves we didn’t know she’d picked up somewhere! Clearly we need to find ways to get out and dance together more often! Thankfully this family program at Wilson Elementary tonight provided a great opportunity for this, along with a lot of additional learning about the school’s unique approach to learning. I think the coaching / integration model of the Kennedy Center PD program is really valuable to consider, not only in the context of arts integration but also thinking about technology integration. Rather than have presenters come share workshops and then teach model lessons in classrooms for teachers, Randy comes for three days and works intensively with SIX teachers. Together, they plan and lead integrated arts lessons together with students which focus heavily on interpretive dance. What a fantastic learning model, and what an amazing school! Read more about Randy’s work for the Kennedy Center in the October 2009 article, “Kingsley students use dance to learn about plant cycles,” sharing about his work in Iowa. The 1.5 minute video “Moved to Learn” is not embeddable but is still available on the same website. It includes interviews with Randy and Iowa students with whom he worked. Randy’s current biography (PDF) is linked from the Kennedy Center’s Professional Development homepage. During the 1977 school year, 250 students from four elementary schools studied language arts concepts through movement and dance activities for twenty weeks. The third grade students involved in the study increased their MAT scores by 13% from fall to spring, while the district-wide average showed a decrease of 2%! The primary grade project students also showed a great improvement in test scores. Most significant was that the research showed a direct relationship between the amount of movement used by the classroom teacher and the percentage increase of students’ test scores. The classroom showing the least increase in test scores used movement fifteen minutes per week for learning language arts concepts. In the classroom that showed the greatest increase, the teacher integrated movement and language arts concepts fifteen minutes per day. As for me and my family, we will take the creative path, for it is the path less traveled and the one far more likely to produce long term learning as well as lifelong skills, with large doses of fun and joy thrown in as well. Wes, I was particularly influenced by the Kennedy Center quote for “art integration” and was moved to take that definition and relate it to my domain: science education. I’ve modifed the statement and have a bit more detail and thought on my blog . Science integration An APPROACH to TEACHING in which students construct and demonstrate UNDERSTANDING through INQUIRY-BASED QUESTIONS AND INVESTIGATION. Students engage in CREATIVE AND LOGICAL/ANALYTICAL PROCESSES which CONNECTS SCIENCE and another subject or skill domain and meets EVOLVING OBJECTIVES in both.